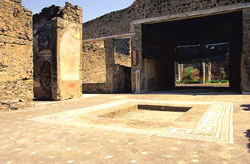 This house, with its classical layout around an atrium and a peristyle, belonged to the banker of Pompeii, and his entire archives consisting of 154 waxed writing tablets dating between 53 and 62 A.D. were found intact. These consisted of sale contract for land, animal or slaves and receipts for the payment of colonial taxes, as L.C. Jucundus was also the official tax collector. The bronze portrait – commissioned by the freedman Felix – found in the tablinum of the house gives us a clear image of what his father looked like. In this house, researchers found two marble bas-reliefs (both subsequently stolen). One of them depicts the Temple of Jupiter which whose damaged during the earthquake of 62 A.D. and the relevant expiatory sacrifice, while the other depicts the Castellum Aquae with the Porta Vesuvio gate collapsing.